Looking for excellent snorkeling spots in Krabi? Koh Lanta Islands can be a perfect place to do different aquatic activities with the peaceful and calm atmosphere of the islands. Unlike the hectic beaches in Ao Nang and Railay, you won’t see too many tourists bustling in the coastline of Lanta Island. Actually, the unspoilt nature, laid-back way of life and minimal developments are the island’s main attraction. Koh Lanta is composed of 52 islands which include Koh Lanta Yai, the biggest island. 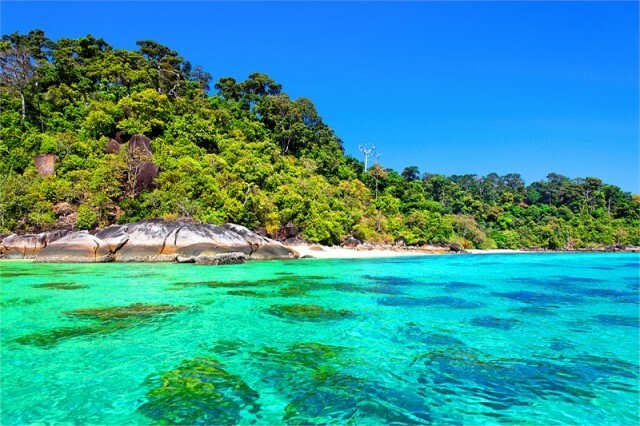 Other islands worth experiencing are Ko Rok, the four islands Ko Muk, Ko Ngai, Ko Kradan, Waen and Cheuak and Ko Phi Phi, which are impressive as well, especially for snorkeling. The white sand beaches, crystal clear water, mountainous landscape, rich coral reef and marine life, the traditional lifestyle of the locals and the overall unique ambience make these places a perfect retreat from the stressful city life. One of the best snorkeling and swimming spots in Koh Lanta Islands is Ko Rok Islands due to its impressive corals, clear blue water and huge amount of tropical marine and aquatic life. Swimming there seems like getting inside an aquarium. Typically, it takes 45 minutes from Koh Lanta to reach this stunning Andaman Island. Ko Rok is composed of two islands, namely Ko Rok Nok and Ko Rok Nai. The larger between the two is Ko Rok Nok, which has several bungalows for tourists who plan to stay overnight. Marine Park HQ can also be found in this island. If you plan on staying there, you need to book in advance as well as get in touch with the National Marine Park in Koh Lanta. On the other hand, Ko Rok Nai is smaller with a little beach on the opposite side. Many boat operators turn around the island for snorkeling and to enjoy the stunning waterfall on the side. Both islands are open only during November to April to give time for marine life regeneration during off-season. Another popular Koh Lanta Island set among tourists are the four islands of Koh Ngai, Kradan, Muk, Waen and Cheuak. Although there are five islands listed, Waen and Cheuak islands are only considered snorkeling stops. These islands are located on the southern part of Koh Lanta and can be reached via speedboat in half an hour. The islands of Ko Muk and Ko Ngai have resorts and bungalows for overnight stays. The amazing Emerald Cave or Tham Morakot can be found on the rocky side of Ko Muk. Entering the cave isn’t dangerous although you have to be a good swimmer and must not be afraid of dark. You can enter the cave during low tide and requires swimming to explore inside. At the end of Emerald cave is a stunning lagoon which is hidden inside the island of Ko Muk. To fully complete your Koh Lanta Islands tour, you have to visit Ko Phi Phi and explore the beauty of the island. The place is accessible by speedboat from Koh Lanta. There are plenty of pristine beaches in Phi Phi island such as the Losamah Bay, Maya Bay, Monkey beach and the island of Phi Phi Don. The truth is, Phi Phi Island is one of the most beautiful island in Southeast Asia: the island attractions, luxury hotels and the classic beaches are only a few of the things you should experience when going to Krabi.